The Westport Weston Cooperative Nursery School made a commitment in September, 2012 to study and improve our approach to outdoor play. 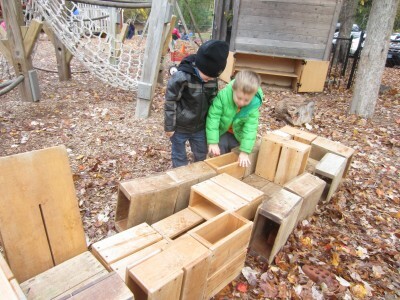 Observation: Staff studied the present uses of the space at that time; what was attractive to the children; what seemed like wasted space; was there a challenge to the play options; what was in disrepair; were there enough materials for all. 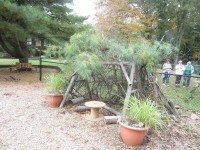 Investigation: We investigated ways to fund our Outdoor Classroom project. We received funding from CT Charts a Course for Professional Development for teachers and a private grant from a family foundation in our area to improve our equipment. Professional Development: The Co-op planned three Nature Explore workshops for staff: Documenting Children’s Learning with Nature; Importance of Visual-Spatial Learning; and Using your Outdoor Classroom. 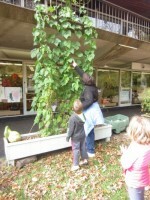 Staff also attended a number of other outside workshops on topics including planting and Big Body Play. Professional Development day was given to have teachers work in small groups taking on a section of the playground for clean-up and aesthetic improvement. entry arches, planting a container garden, and a tree surround bench with brick sitting wall for gathering. 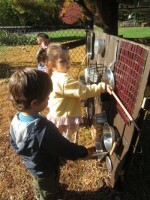 We also installed a rain barrel for water in our messy play area. Planning: Teachers plan outdoor curriculum on a weekly basis. They gather new materials regularly for the children to explore; vines, hay, bamboo poles, and other local resources they find. Teachers engage children in planning what will come next in their play, encouraging co-operation and brainstorming the use of materials and space. 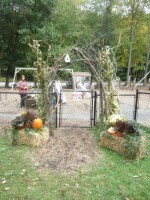 Assessing: Teachers observe children’s play; their use of equipment and the natural materials provided. They also observe the areas drawing children into play and watch for less attractive areas. Teachers take photos to document activities. 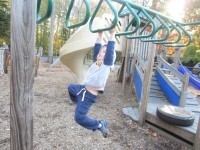 Photos are used to identify more active areas of the playground and are also placed in the children’s journals as evidence of participation in activities as well as evidence of skill building.